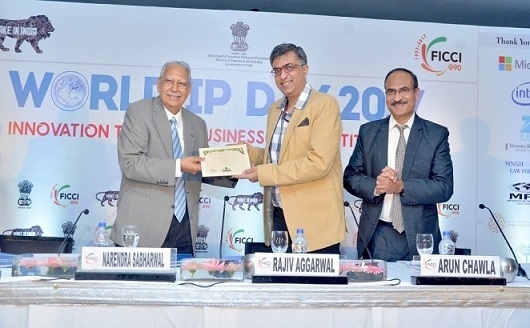 FICCI had commemorated the World IP Day 2017 by organizing a Conference "Innovation to Drive Business and Competitiveness" on 28th April 2017 at The Park Hotel, New Delhi. In recent years, Intellectual Property has spawned a new wave of technological innovations, leading to rapid economic growth and development. As businesses grow and attract competition, the need to identify, develop and leverage IP becomes even more important in order to sustain and thrive in the market. Capturing this essence and the increasing IP buzz in the country, FICCI had organized the World IP Day 2017 conference. The Conference has provided a useful forum for industry leaders, IP professionals and business experts, to deliberate on the importance and potential of generating, protecting, enforcing, commercializing and incorporating IP and innovation in the core of business strategies.